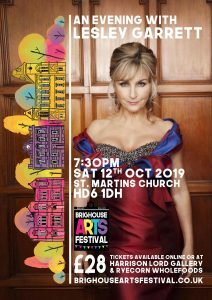 The Brighouse Arts Festival which will be held on 4th to 13th of October is delighted to announce that the headline act of this year’s event will be Lesley Garrett the famous Yorkshire singer. She will be giving a recital on Saturday 12th October at St Martin’s Church. The organisers believe that her appearance in Brighouse is a Yorkshire exclusive. The show is entitled “An evening with Lesley Garrett”. She will be singing and talking about her glittering career in music. Lesley’s major television appearances include Lesley Garrett…Tonight, The Lesley Garrett Show, Strictly Come Dancing, Loose Women and most recently a Songs of Praise Special – My Story, My Music with Aled Jones for the BBC. Lesley was also the subject of a South Bank Show on LWT. Booking is now open for our headline acts – “An evening with Lesley Garrett”, “Kiki Dee”, “Roger Davies” and “The 39 Steps”. BOOK NOW to avoid disappointment. The Brighouse Festival sees Brighouse playing host to some high profile and successful performers. The Festival is being hosted at a number of venues across Brighouse including The Central Methodist Church, The Smith Art Gallery and Library, The Salvation Army Citadel and St. Martin’s Parish Church in addition to which a number of small and large businesses are also offering events. Further events and activities will be announced over the coming months and a programme of activity will be available in the near future which will include details of how to obtain tickets for the modestly priced events. However, the good news is though that some of the events will be free to attend. Our aim is to have a larger impact on the arts and community. After our successful arts festival last year, we are looking to develop on community and professional works presented at the festival. With new arts activities and high quality artistic events throughout our arts festival. Our program of events includes theatre, music, literature, dance, photography and crafts. We will look for innovative ways of engaging with the public to introduce local people to great art; which will inspire and create activities which bring people together. Brighouse Arts Festival Website: www.brighouseartsfestival.co.uk to book online. Arts for Brighouse currently organises an annual 7 day Brighouse Arts Festival. In 2018 we programmed events which attracted over 1,400 active audience members and an online outreach to 120,000 people. The festival brings Art, Theatre, Literature and Music and an array of artistic activities together that are easily accessible to the general public. Copyright © 2019 Brighouse Events. All rights reserved.